OMChristmas 2013: Wow! 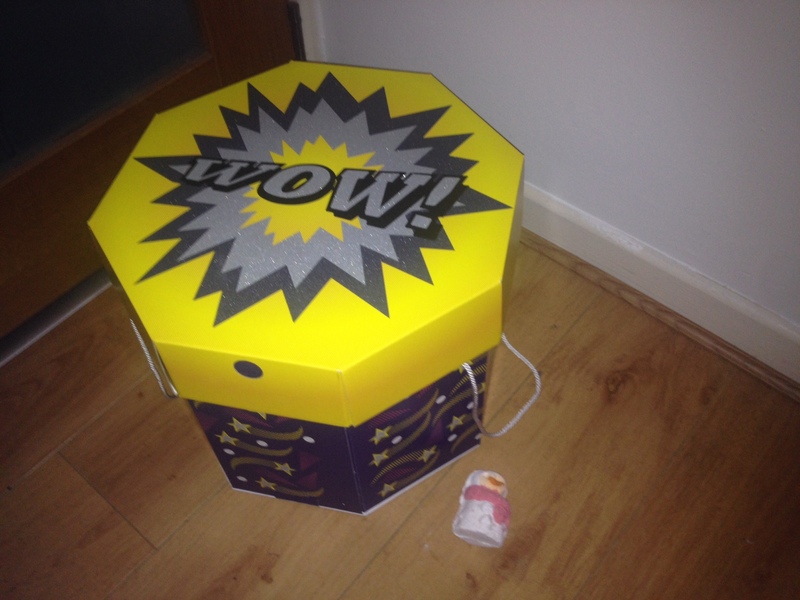 Hatbox from LUSH | Bright & Beautyfull! Ahhhhhhhhhhhhh! This happens every year: the press releases start rolling in, in September, and I get all, Oh, Christmas is miles away…; and then the launches start, and I think, Hmmm, time is flying! ; and then the day comes when it is mid-November and I go Shite! There is like six weeks to go! Let the scrambling begin! LUSH do a great line in beautifully designed and packaged Christmas gifts, and this has to be the most spectacular of them all, ever. It is crazzzzzy full of their signature holiday stuff, mainly in the bath ballistic/bubble bar line, as the freshly-made scrubs and cleansers wouldn’t make their sell-by dates. That’s how big the box is. I had initially taken a photo of the box with a pencil lying on the floor, because… I don’t know why, because people used to use pencils for scale, much less writing? I can’t even believe I had a pencil in the house! Then it occurred that the pencil was ridic, and I used the Snowman instead. I was so eager to paw through this that I didn’t take any photos of the interior, so will have to do this the old-fashioned way and use my words. There are three stacked trays with 32 individual compartments, in which resides each product, and the whole shootin’ match is full of styrofoam beans to keep everything from getting smashed. 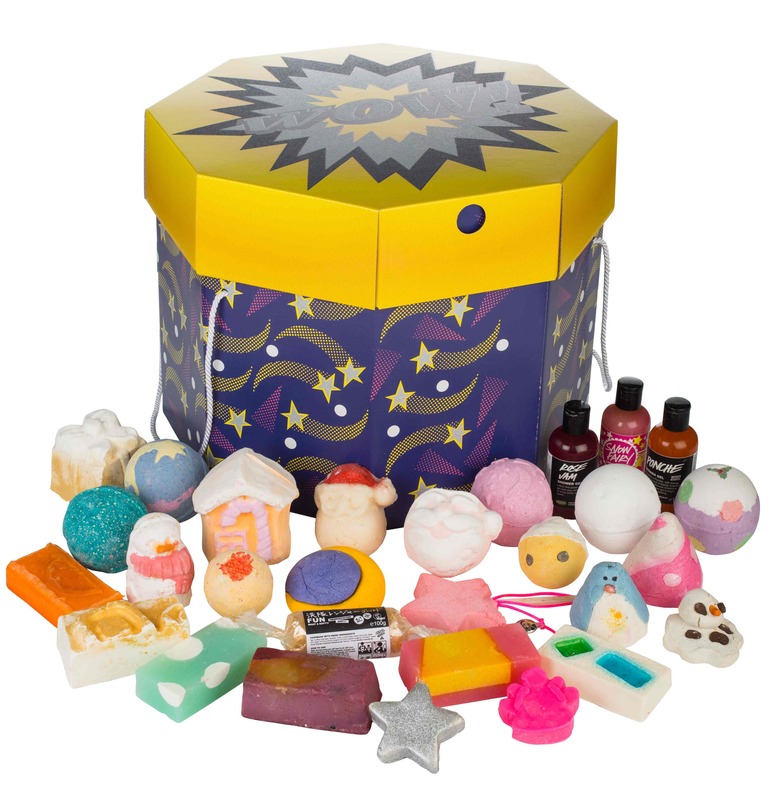 The assortment includes shower gels, bars of soap, bath melts, lip tint, lip scrub, and an array of the ballistics and bubble bars, and couple of body creams. Since I’ve finally figured out how to run a decent bath in this place I am living — because the immersion is like the size of my kettle — I took several of the bits for a test-bathe. It was so hard to choose! > I loved the look of So White and wanted very much to be in a tub full of whiteness, just like Cleopatra and her famous milk baths. It was, for about two minutes, and then the core was exposed, and turned the water a really dark red. I wasn’t mad about the scent, either. > Wasn’t crazy about Cinders, and didn’t feel that the popping candy, which is embedded in it, worked all that well. But! My skin felt stupid silky afterwards. > Adored unconditionally Lord of Misrule, which renders the water a deep, dark green, and the fumes rising off it are imbued with Fair Trade vanilla absolute and patchouli. > Also very much loved the Christmas Eve Bubble Bar. I have not liked the bars much in the past, but this is where Lush really do stand out: they keep improving all their formulae, and I must say, this has really gotten better. Much better bubblage than before! > I am deeply swoony about the Snowcake Soap, which is evocative of marzipan, which I only like in small doses. Not so this! Big doses of this soap, please! > I was also taken with the new Rose Jam Shower Gel, but not so much with Snow Fairy. The former has some lemon oil in it to give it a bit of bite; the latter is just too sweet for me. > Also was hearted, big time: Bombardino. Based on an aprés-ski Italian bevvie, this is full of Sicilian lemony goodness, and made me want to drink the bath water, which is disgusting on so many levels. Barely scratched the surface! There is so much clean in this big box, and so many different textures and ‘flavours’, it’s the perfect gift to not only club in on with, say, three other family members, but you can also get away with buying this for a bunch of nieces, and not look scabby. Seriously, I’d say it’d take two people the guts of three months to go through all this, if not longer! Okay, wait for it — €169.95/£129.95/$249.95.